Public access to the Dam Wall is closed. The first major dam built for irrigation in NSW when construction began before World War I, Burrinjuck Dam helped drive the economic development of the Riverina as a major food producing region. Today the dam continues to support agriculture across the 660,000 square kilometres of the Murrumbidgee Irrigation Area centred around the towns of Griffith and Leeton. It also supplies stock and household needs for landholders and towns along the Murrumbidgee River, environmental flows, flood mitigation and hydroelectricity. The large lake has become a popular sport and recreation destination. Burrinjuck Road provides glimpses of the dam wall and spillway. No public access to dam wall. The 75 hectare park provides several vantage points with panoramic views of the lake and foreshores. Burrinjuck Dam grounds are open though access to the wall is closed to the general public. The office is open from 9am to 5pm daily. Phone (02) 6227 8114. Burrinjuck Dam is 55 kilometres south-west of Yass on the south west slopes of NSW. Yass is 279 kilometres south-west of Sydney via the Hume Highway. Lake Burrinjuck’s foreshores offer a range of accommodation options. Reflections Holiday Park - Burrinjuck Waters is located close to the dam wall, surrounded by bush on the southern escarpment of Mount Barren Jack. Water enthusiasts can enjoy water sports including skiing, jet skis, sailing, canoeing and swimming. Several boat ramps are available at camping grounds around the lake foreshores. Lake Burrinjuck is home to the Murray cod, as well as golden perch (yellow belly), silver perch, brown and rainbow trout, redfin and European carp. Burrinjuck Waters State Park includes a variety of walking trails ranging from the easy to more challenging. The historic Hume and Hovell Walking Track passes through Burrinjuck Waters State Park on its 440 km journey between Yass and Albury. Follow in the footsteps of explorers Hamilton Hume and William Hovell on their expedition to Port Phillip in 1824. Burrinjuck Dam is situated near the headwaters of the Murrumbidgee River in the Great Dividing Range. It is about 55 kilometres south-west of Yass, and about 330 kilometres south-west of Sydney. 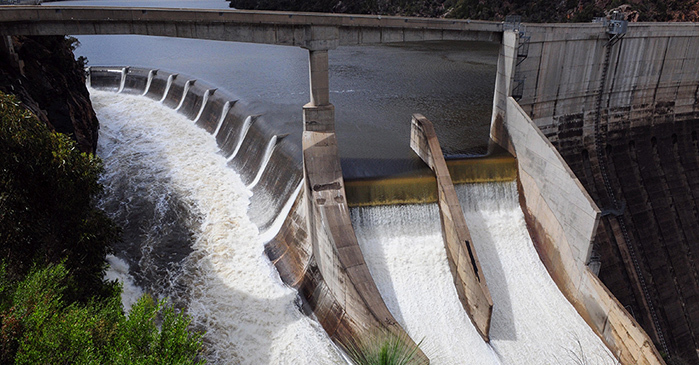 Burrinjuck Dam is the main water storage for the Murrumbidgee Irrigation Scheme, a 660,000 hectare area in the Riverina irrigated with a series of weirs, canals and holding ponds. The dam has a capacity of 1,026,000 megalitres, twice the volume of Sydney Harbour. The name Burrinjuck comes from the Aboriginal words ‘booren yiack’, meaning precipitous mountain. The dam is appropriately named as it lies between the Barren Jack and Black Andrew mountains. In 1891 the Murrumbidgee Valley was identified as being ideal for irrigation development. After devastating droughts in 1901-02, the NSW Parliament approved the establishment of the Murrumbidgee Irrigation Area Scheme to control and divert the flow of local river systems for the purpose of food production. Burrinjuck was the first major dam built for irrigation in NSW. When construction began in 1909, it was the fourth largest dam in the world. Construction delays due to World War I meant the original design was not completed until 1928. Burrinjuck releases water for irrigation of crops in the Murrumbidgee Irrigation Area, including cotton and fruit and vegetables, as well as pastures for sheep and cattle. In addition to irrigated agriculture, the dam provides water for town supplies, industry and domestic requirements, environmental flows, flood mitigation and recreation, and a 28 megawatt hydroelectric power station using irrigation releases, environmental flows and flood mitigation. Burrinjuck Dam was built in a narrow gorge on the Murrumbidgee River. The steep gorge required the erection of a cableway across the spillway face to ferry workers and materials from one side to the other. Building materials were delivered to the site by a wood-burning locomotive travelling on a narrow gauge railway line built for the project, connecting the construction site to the main southern line at Goondah, south of Yass, 42 kilometres away. Burrinjuck is a mass gravity dam which holds back water by using its own weight. The wall was built using cyclopean masonry with giant concrete blocks fitted into an irregular pattern. Granite quarried on the site was mixed with sand barged from up river and cement transported by rail. Each block contains a giant granite boulder, weighing on average four to five tons. Work started in 1909 but was not completed for 20 years due to World War I and labour shortages. Hundreds of workers lived on-site at ‘Burrinjuck City’ in barracks provided for single men. They used steam engines and manual labour to build the massive wall. Following a big flood in 1925 that sent water pouring more than a metre over the wall, it became clear the height of the wall and size of the spillways had to be increased. These enlargement works continued for another 20 years between 1937 and 1956, again interrupted by war. To meet modern dam safety standards and increase dam safety in the event of extreme flooding, between 1986 and 1994 the wall was strengthened by post-tensioned anchors, the dam’s spillways were upgraded and the wall was raised by 13.4 metres to its current height of 92.4 metres. Trigger - Flow increases of 5,000, 10,000 and 15,000 megalitres per day. Trigger - Spillway flows of over 392,000 megalitres per day, last reached in 1974. Notification - Flows of over 392,000 megalitres per day are being passed, levels last reached in 1974. Range - 0 to 1,000 megalitres per day. Trigger - When flow increases above 1000 megalitres per day, or when they raise in 1,500 mega litres per day increases after that.